For a three-week period in late November/early December 2018, Alex wasn’t himself. He was running a low-grade fever, he was exhausted and bruising appeared on his chest and back. A visit to his family doctor and subsequent testing didn’t indicate anything sinister. His bloodwork numbers were within a normal range. But his symptoms lingered and then worsened. By December 23 he was experiencing nausea, wouldn’t eat, his gums were so swollen his teeth were obscured and he was lethargic. It was a dramatic decline. His parents did a little online research and feared that his symptoms were an indication of leukemia. Alex’s father drove him to the hospital Emergency Department, described the previous three weeks. They arrived around 11:00 AM. By 4:00 that afternoon Alex was admitted to the cancer ward with a diagnosis of AML, acute myeloid leukemia. What Alex remembers is arriving to the Emergency Department and receiving Christmas gifts, activity sets, stuffed animals and toys to take up to his room. Alex spent Christmas eve receiving his first dose of intensive chemotherapy. AML, is a cancer of the blood and the bone marrow. It is treated with a very intensified course of chemotherapy over a short period of time (usually five to six months). Because the treatment is so intense AML patients are at increased risk of contracting infections and spend almost the entire course of their treatment in-hospital. Since December 24, 2018 and today Alex has only spent five days back at home. His first round of induction chemotherapy lasted 23 days, his second round lasted 29 days and he is currently in the midst of his third round of induction chemotherapy. 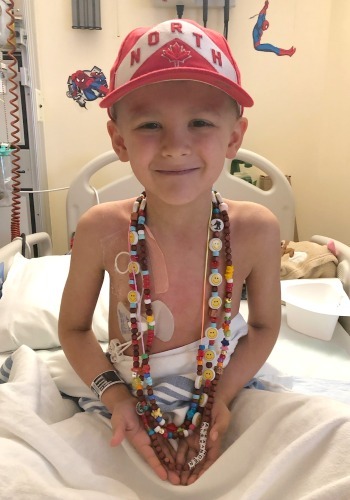 When this third round is complete he will be reassessed to determine next steps which may either be a fourth round or chemotherapy or a bone marrow transplant. Alex has had a smile on his face throughout his brutal chemotherapy regimen. He enjoys visits from the professional sports teams, loves doing activities with the Child Life specialists in his room or in the playrooms and lounges and he also loves time with the therapeutic clowns. Lately, he’s developed an interest in ukulele and is learning to play. His favorite activities are playing video games, building with Lego and playing Lego videogames!